For those of you who haven’t ever dyed your hair something bright, whether it be hot pink, neon blue, or just a very vibrant copper, you may not know (because I didn’t fully understand) just how much it takes to maintain brightly-dyed hair. I figured it’d be much like my regular hair that I’d been dying red for years, but it wasn’t… The cost, fading, and effort is nearly triple (or more) as much as a regular color requires. 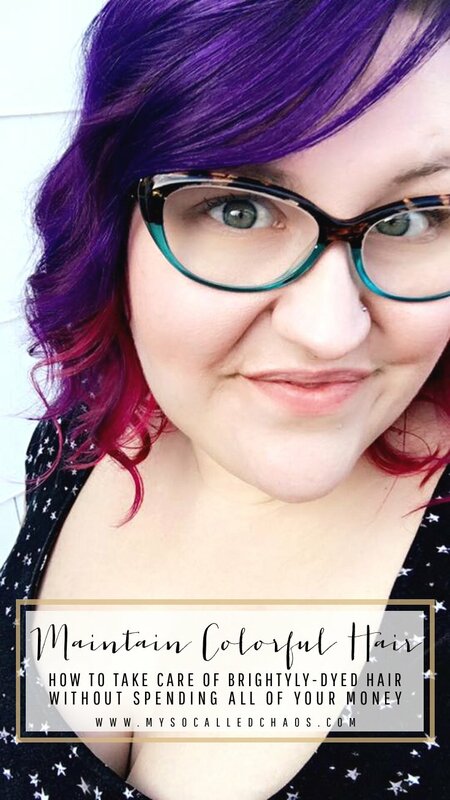 A few weeks ago I shared my knowledge on how to prepare for and get bright-colored hair, so I figured I’d share that today I’d shared what I have learned about how to maintain brightly-dyed and colorful hair. What is blogging for if not to share knowledge? As I mentioned in that previous post (linked above) it can be quite costly to dye your hair an unnatural color. My initial expense was around $170+ and a touch up (with trim and style) ended up costing around $80. I just can’t afford to go into the salon every few weeks to keep it looking pretty, and I don’t want to walk around with an awful faded color either. Here’s what I’ve learned that should help you keep your colorful hair going strong without spending every dime you own going back to the Salon for touch-ups every two weeks. I’ve gotten it down to where I only need to go in every 2-ish months-unless I have something important (a trip, a photo shoot, etc.) I want to look extra good for. This post contains some affiliate links. At no cost to you, I may be compensated in a small percentage for anything you buy via my links. This helps keep this blog going and I’m very grateful! The first time I took a shower, before I even put shampoo in my hair, I watched in agony as what looked like the entire purple pigment my hair contained washed down the drain. It took everything I had not to cry over it… I stood there staring at the dark purple water swirling and contemplating just how painful it was to wash a an almost two-hundred dollar dye job down the drain only a few days in… Ouch. At least now, knowing what I know and altering my routine to fix it, there’s much less panic when the water is almost entirely purple at my feet.. When washing your hair, you’ll want to use cold water-as cold as you can stand. A lot of my time in the shower is spent switching between hot and cold. On days I wash my hair I hop in the shower and stand back as I set it to cold water. I apply shampoo, and rinse, then I apply conditioner and hold it out of the way (or clip it up or put it in a shower cap) while I wash the rest of my body. When it’s time to rinse, I put it back to cold and remove the conditioner with the water as cool as I can bear. This one is a no-brainer if you’ve ever colored your hair-even if you’re not doing bright-colors you have to pick up a color-safe shampoo and conditioner or your color strips out. When I first dyed my hair purple I swung by Sally Beauty Supply and snagged asked the girl what products I should use to keep the color best. She pointed me in the direction of the ion brand, and I picked up ion Color Defense Shampoo and the Intense Moisture Conditioner. Since the brand happened to be on sale, I also picked up the Color Defense Leave in Protector, Color Preserving Masque, and the Color Defense After-Color Sealer. I’ll admit, I have only used the conditioner once (which I’ll explain in a moment), and never used the masque or the sealer… I’m sure they’ll come in handy at some point though, so I don’t mind having them on hand. Note: There is some debate on whether or shampoos and conditioners labeled “color-safe” are any different from regular shampoos and conditioners, but I haven’t had a lot of issue with them costing more so why not play it safe either way? Another thing people make the mistake of doing is totally smothering their hair in shampoo. It isn’t really that necessary, not unless your hair is ridiculously dirty, and it can make your color fade so much faster (even if you are using a color-safe shampoo). Just put about a nickle sized amount into your hands and apply directly to your roots. Give your roots a tiny bit of a scrub to get the grease out, and then lightly and quickly run it through the strands of your hair. Your ends probably don’t even need shampooing at all. Are you washing your hair too much? Overdoing it on the shampoo? STOP! Rinse immediately, there’s no need to let it sit and pull out more of your hair color. One exception I’ve found on this is the EverPure Cleansing Balm from L’Oréal (get the one specifically for color-treated hair) which I was sent by Influenster. I was actually surprised when I liked it better than the nice stuff I bought, and it has conditioner in it (the instructions say you don’t even need to condition separately-but I still do) so I leave it for a few minutes. It also seems to remove less of my color than the regular shampoo which I end up using if I’m in a bit of a rush. As someone who showers every day, I’d also fallen into the bad habit of washing my hair every single day as well. This isn’t healthy for your hair even if it isn’t dyed because it dries it out, and your scalp starts overproducing oils to counter the effect. This means, if you ever skip a day of washing your hair (say you are traveling or camping or something) it gets bad fast. For this reason, I’d gotten into the habit of never skipping a day if I could help it because it felt so gross, and the idea of trying to skip days in order preserve my hair color made me cringe, but I forced myself to start doing it-and my hair is so much healthier for it and my color has remained much longer since. Also, your body adjusts, and soon your scalp dials it back with the oils and everything feels okay. I even sometimes wash on the third day if it’s not feeling too full of product or oils. If you’re having a hard time with the skipping of days, dry shampoo might be your best bet. I’d never had much luck with dry shampoo in the past, and when my stylist recommended it I snagged the dry shampoo by ion at the recommendation of the girl working behind the counter at Sally’s. I’m still not in love… I don’t know if it’s that my hair is so fine or what, but I feel like the dry shampoo just makes it feel and look more dirty… When I brought this up with my stylist, she said she swears by dry shampoo but there are two things you have to know. The first thing she mentioned is that different products feel and work differently for individuals. She’s been using one called Not Your Mother’s Clean Freak Dry Shampoo that she can just get at the local grocery store. She says it’s inexpensive and she likes it just as much as any of the more expensive ones she’s tried before. Also, since since speaking to a few other friends about dry shampoo they’ve all mentioned their own favorite brands, all different from the rest, and most of them found their favorites through lots of trial and error. I think I still need trial and error here to find one that works for me, but if you have suggestions for a color-safe dry shampoo that works great on fine and oily hair; I’d love to hear them. Spray dry shampoo in short bursts to different sections of your roots. Use the pads of your fingers to massage the dry into your scalp at the roots. Let sit for a good 5-10 minutes so it can adequately soak up the oils. Brush out either with a loose bristle brush or your fingers. At first when you use dry shampoo, it may still feel just as gross since you’re putting a product in right at your roots, but from what I hear-when you get the right one-you’ll get used to it and start to feel cleaner after using dry shampoo. Another thing that I’d never owned, or really understood why people owned, was a shower cap. I quickly realized that trying to shower on a day when I wasn’t washing my hair was really difficult. I didn’t even want the water to touch my hair at all (even just getting it wet makes some of the color bleed out) and avoiding that when I was washing my body and my face was near impossible-even with it all piled on top of my head and clipped back. A shower cap has been the best thing and has made my life so much easier. Perhaps the absolute best weapon when it comes to maintaining your colorful hair is a colored conditioner. What is a colored conditioner? It’s a conditioner, that is not only color-safe and sulfate-free, but it also has color pigment in it that it deposits every time you use it. This means that each time you condition your hair, you’re putting more color back into it. I’ve seen a few around, but I cannot express just how much I love love love the brand Overtone for this. They’re not even an affiliate (seriously, if you go to that link and buy from them, it earns me nothing) but I just love the stuff so much and figure those of you with brightly-dyed hair need to know about it. 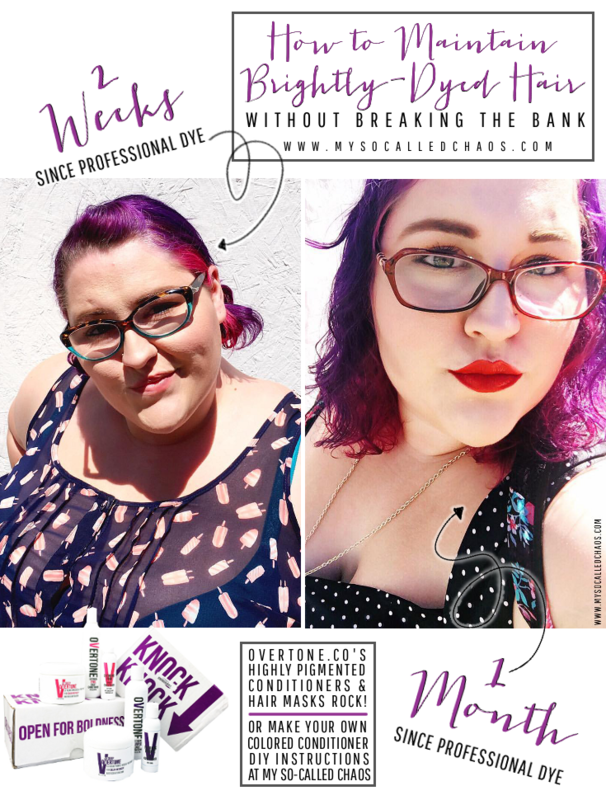 I’ve been using their Extreme Purple and Extreme Pink to maintain my color, with both their regular conditioner and their Go Deep Hair Masque. I can buy the whole set for only $47 and I only need to get it every other month. MUCH less expensive than having to go back to the salon every 3-6 weeks. Typically I just use it in the shower after a wash, but once a week I use the hair mask on my hair when it’s dry and let it sit even longer (about 30 min) so it re-dyes it essentially. It’s fantastic! The Overtone colors weren’t the same as my Pravana colors that my stylist used, but by mixing the purple and pink (or switching off each time I shower), I can get it pretty close to them. Strapped for cash? You can totally DIY colored conditioner on your own-especially if you dyed your hair yourself. If you dyed your hair yourself and you have left over dye (not the bleach, but the actual pigmented color) just add it to a bottle of conditioner! The more you add, the more color it’s going to apply when you dye your hair. If you don’t have any left over-pick up another bottle of the same color to add to your conditioner. If you dyed it at a salon, you wont have color left over, but you can pick up a bottle of bright hair dye that is similar to the color you’ve done your hair and add it to your conditioner. If your shade isn’t the same, get two colors and two conditioners to mix them each with. Then alternate which ones you use when you do your hair, or mix them together when you’re conditioning. No, heat is not always the enemy, and if you have perfectly healthy hair heat (as long as it’s not excessive temperatures) may be just fine on it. However, when you dye your hair it alters that “perfectly healthy” status and puts stress on your hair, which means that heat may affect it differently than it did before you dye it. It’s still okay to use heat on your hair, but you should definitely pick up a color-safe heat protectant to use before styling. Sun damage is actually one of the biggest issues when it comes to fading, and if you spend a lot of time in the sun you’ll want to take some precautions to ensure that it isn’t fading your color while you’re out there. Yep, simple as that, protect your pretty colored hair by wearing a hat (or other cover-scarf, bandanna, etc.) when you’re outdoors. It doesn’t have to be ugly or an old ball cap (unless that’s what you like), you can find all sorts of adorable and fashionable hats and hair accessories that are suitable for blocking the sun and make you look super cute too. Did you know that hair sunscreen exists? I didn’t until very recently, but what a brilliant idea! Mostly, it blocks harmful UV rays and if you’re going to be in the sun a lot you should definitely invest in a bottle and give your hair a spritz now and then. With it being Summer, chances are there’s some Swimming in your future… Whether it’s a day at the beach, surfing lessons, taking the kids to the pool, or you swim for fitness-that water can really be the biggest cause of fading you’ll see. Water is the main reason hair color bleeds out and fades, but add to it the salt from ocean water or the chlorine and other chemicals in a pool, and that pretty dye job is a gonner. The best (and really only effective) way to protect your hair is to get a swim cap and wear it when you plan to submerge your head in the water. Have any brightly-dyed hair tips? Hopefully all of the tips in this post will help you maintain that vibrant color that you love so much! If I missed anything, let me know in the comments-I’m always looking for more tips!